Denis is dead. Well, he’s supposed to be but his twin brother, Matt, is keeping him from fully moving to the great beyond. Denis was murdered and Matt is consumed with trying to solve the case surrounding his brother’s mysterious end. Denis wants only to rest peacefully, but when he returns to earth to tell this to Matt, he gets sucked into the secrets his family has buried. 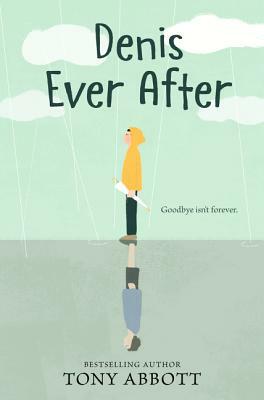 Heavy and moving but still funny, Denis Ever After is a thrilling tale of family, love, and why not all sleeping dogs should be left to lie. Written by award-winning author Tony Abbott and perfect for fans of The Ethan I Was Before and The Thing About Jellyfish, this bittersweet middle grade novel follows the ghost of Denis Egan as he teams up with his living twin brother to solve the mystery of his death.